The Glomerular Filtration Rate (GFR) is the volume of fluid filtered through the body's glomeruli per unit time (Measured in ml/min). The principles governing the GFR are in reality a specialized application of the principles discussed in microcirculatory physiology and are thus ultimately governed by Starling Forces. Below we discuss the physical determinants of GFR and how they can be physiologically modulated. As mentioned, the rate of glomerular filtration is essentially governed by Starling Forces. However, because the glomerular capillaries are surrounded by the fluid in the Bowman's Capsule, the hydrostatic and oncotic pressure of Bowman's Space is used instead of those of the 'Interstitial Fluid'. Importantly, because no plasma proteins can cross the glomerular barrier during glomerular filtration, the oncotic pressure of fluid in Bowman's Space is essentially zero and is thus removed from the starling equation. 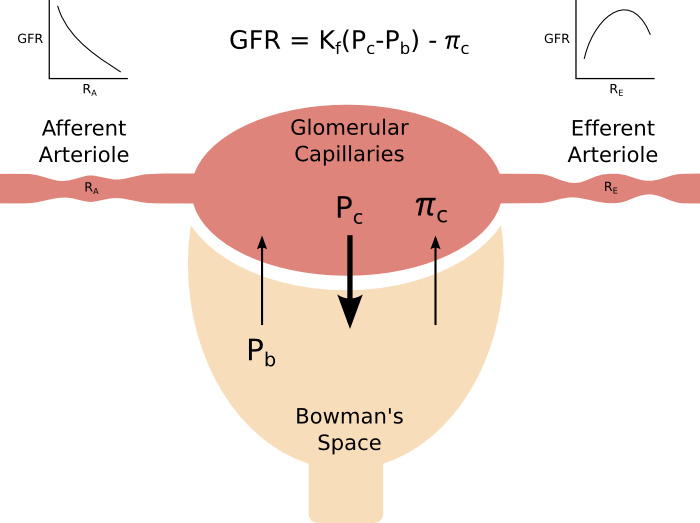 The Glomerular Filtration Rate (GFR) is a quantitation of the volume of fluid filtered through the glomerular barrier per unit time. The GFR is essentially determined by a special case of the starling equation and is given above. The primary physiological modulators of GFR are the afferent and efferent arteriolar resistances (RA and RE). As expected, increasing the afferent arteriolar resistance (RA) drops the pressure within the glomerulus and thus reduces GFR. The relationship between the efferent arteriolar resistance (RE) and GFR is more complicated. Initially, increasing RE boosts the pressure within the glomerulus and thus increases GFR. However, at higher values of RE the total blood flow through the glomerulus decreases and thus GFR drops. The GFR can be modulated by changing any of the variables mentioned above. However, the primary physiological mechanism by which GFR is modulated is through modification of the glomerular capillary hydrostatic pressure. The glomerular capillary pressure is itself determined by three variables as discussed below. Naturally, increased or decreased incoming systemic arterial blood pressures will increase or decrease the hydrostatic pressures within the glomerular capillaries. However, due to autoregulatory mechanisms discussed in Autoregulation of GFR and RBF incoming arterial pressures into the glomerulus are largely constant over a wide range of systemic arterial pressures and thus are not a major source of regulation. Whatever the incoming arterial pressure, the resistance offered by the renal afferent arteriole is a major determinant of the ultimate hydrostatic pressure within the glomerulus. If afferent arteriolar resistance is increased, the hydrostatic pressure within the glomerulus declines and so too does the glomerular filtration rate. Conversely, if the afferent arteriolar resistance is decreased, the hydrostatic pressure within the glomerulus increases and so too does the glomerular filtration rate. Consequently, regulation of renal afferent arteriolar resistance is a major source of modulation of the GFR. The relationship between the resistance of the renal efferent arteriole with GFR is more complex and not well-understood. A hand-waving explanation is that increased renal efferent arteriolar resistance causes backup of blood into the glomerulus and consequently increases glomerular hydrostatic pressures and thus GFR. However, as efferent arteriolar resistance increases, the renal blood flow also declines, resulting in reduced GFR. Empirically, these two antagonistic phenomenon result in a biphasic relationship to increased efferent arteriolar resistance and GFR. Initial increments in efferent arteriolar resistance increase GFR; however, larger increments in efferent resistance result in decreased GFR. Although modulation of any of the other variables mentioned under "Physical Determinants" can change the GFR, these are not major sources of physiological GFR regulation. However, as mentioned below, some of these variables are affected in certain disease states and thus can result in pathological changes in GFR. The permeability of the glomerular barrier can decline due to thickening of the glomerular basement membrane as occurs in diabetic nephropathy. Additionally, total glomerular permeability can decline due to reductions in the total number of functional glomeruli, thus reducing the total glomerular surface area as occurs in hypertension. In cases of urinary tract obstruction resulting in hydronephrosis, fluid backup into Bowman's Space can increase its hydrostatic pressure and thus reduce GFR.